Flavourful. Succulent. Melt-in-mouth. Delicious. Seriously addictive. That’s kabab or kebab for you. If you think vegetarian food is boring, then think again! 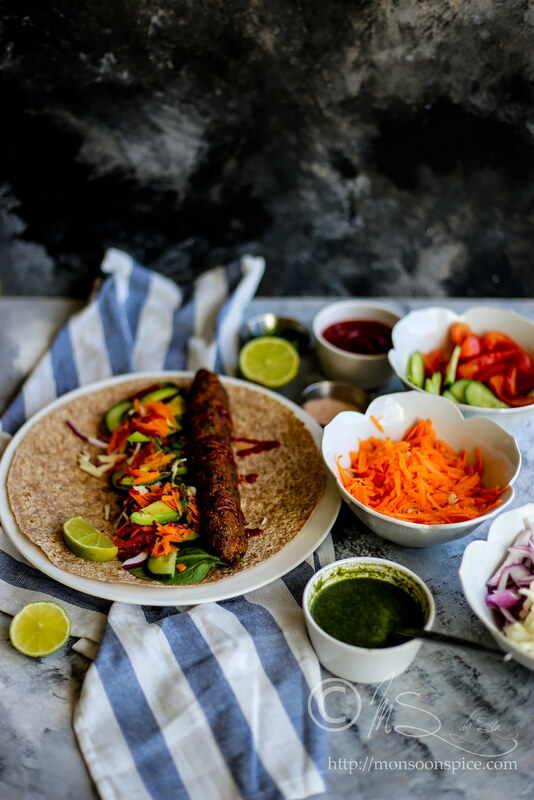 This Veg Seekh Kabab or Vegetarian Seekh Kebab is a serious contender for their meaty counterpart and will give run for their money. 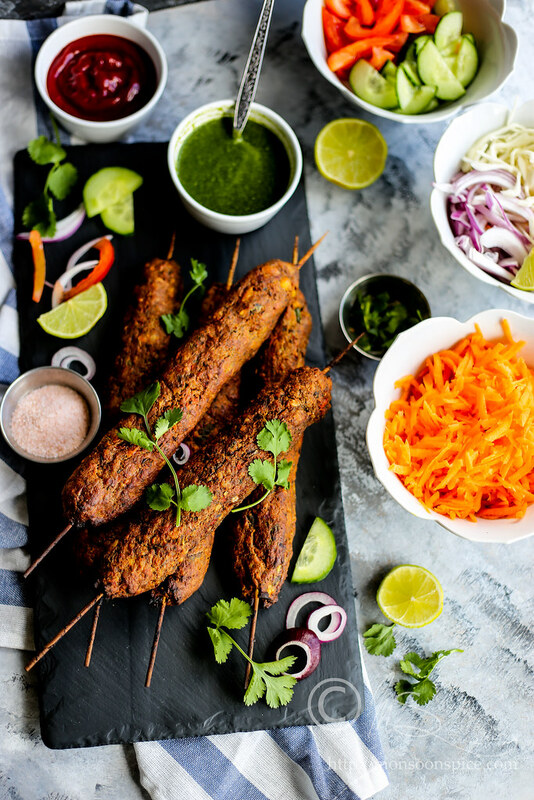 Made with minced vegetables, cottage cheese and carefully selected spice blend, these kababs are a fine example of how a strong and complex flavours can work beautifully when they are carefully balanced to create a dish where the flavours in the end blend harmoniously without any one ingredient overpowering the other. This labour intensive dish is a result of my labour of love over many years as I have tried and tested over and over until I finally got that perfect blend of flavour, aroma, texture and taste by carefully measuring and balancing the ingredients and spices. 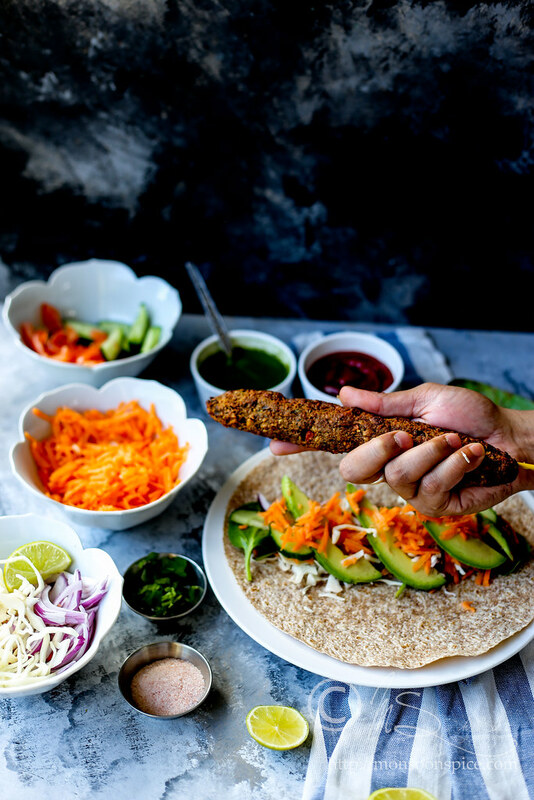 During my quest for perfecting the recipe for Vegetarian Seekh Kebab, I came across couple of interesting articles that gave an insight into the history of these much loved food around the globe. This is going to be one word heavy and photo heavy post and I must warn you well in advance so that you can skip the lengthy post and jump to the recipe post. 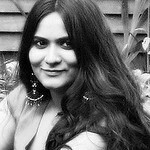 But if you are a sucker for food stories and the rich history, stay with me as I take you on a culinary journey into the world of kebabs and the stories about the birth of kebabs, how they travelled around the world and how every country adapted them. In Iran, the modern day Persia believed to be the birth place of kebab, it is a national dish and is served with either with the steamed saffron Basmati or Persian rice or with the various types of bread such as Lavash. Iran has more than seven types of kebab, which form a significant part of the Iranian diet. It is served with the basic Iranian meal accompaniments, in addition to grilled tomatoes on the side of the rice and butter on top of the rice. Similar to Iran, Turkish cuisine has varieties of kebabs such as Shish kebab (skewered meat), Cağ Kebabi (modern day donor kebab), Döner kebab, Adana kebabi (hand minced meat kebab in a skewer), steam kebabi (Turkish stew cooked in an earthen casserole) and testi kebab (mixture of meat and vegetables cooked in a clay pot or jug over fire). When the kebab made it to Greece via the Turks, it turned into something different. In Greece, Gyros (known simply as Döner kebeb) and Souvlaki (similar to Turkish Shish Kebebs, but is usually made with pork) are served as a sandwich rolled in pitta or on a plate with french fries and various salads and sauces such as tzatziki. Although gyros is unquestionably of Middle Eastern origin, the issue of whether modern day souvlaki came to Green from Turkey and should be considered a Greek version of Shish Kebab or is a contemporary revival of Greek tradition during the Minoan civilisation dating back to 17th century BC is a topic of heated debate, at least between Greeks and Turks. The kebab went in many other directions, too, carried along the Silk Road eastward by traders who found cooking small morsels of meat over an open flame on a stick quick, cheap, and efficient. In Georgia in the Caucasus Mountains, the kebab became known as a shashlik, and from then developed into an important aspect of Russian cuisine and that of other former Soviet republics. In China, Chuanr often referred to as "chua'r" in Pekingese and throughout the North, or kawap in Uyghur, is a variation of kebab originating from the Uyghurs in the Western province of Xinjiang and a popular dish in Chinese Islamic cuisine is one of the popular street food. The most traditional form of Chuanr uses lamb or mutton, but kebabs made with chicken, beef, pork and seafood are also quite popular street foods where small pieces of meat, flavoured with common spices and condiments including cumin called ‘zoran’, pepper, sesame and sesame oil, are skewered and either roasted or deep fried. While the Nepalese cuisine has a popular Sekuwa, meat flavoured with natural herbs and spices and roasted in a natural wood fire, Kebabs in Pakistan trace their origin to the influence of the Mughalai cuisine in South Asia. Some of the popular Kebabs in Pakistan are chapli kebab, shami kebab, seekh kebab and bun kebab. The fascinating history of kababs of India has many interesting tales to tell. 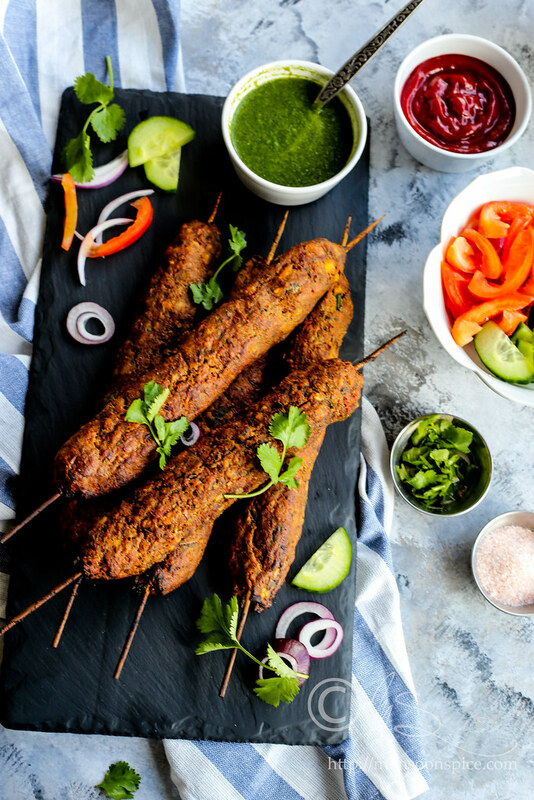 While ancient Indian books, such as Mahabharata, mentions a dish made of marinated game meats roasted on large open fires, the modern day kebabs trace their origin to the Mughal empire in medieval times. It is said that when Alexander the Great met King Porus, he was, to his surprise, offered meat mish-mashes that were similar to kebab of Greece. According to Ibn Battuta, the famous Moroccan traveller, kebabs were served in the Indian royal houses as early as 1200 AD, may be around the time when Afghan plunderers invaded the country, and not only the royal households but commoners too enjoyed a meal of kebab and naan. But the official entry of kebabs into India, and to Awadh (present day Uttar Pradesh) is credited to the first Nawab of Awadh Sadat Ali Khan. The pre Mughal kebab was more about marinade and meat being more of rustic chewy chunks, basic spices and char-grilled ovens as compared to the Mughal period where the kebabs evolved into a delicacy which was tender and succulent with array of aromatic spices and much richer with the use of dry fruits and nuts. It is believed that the kebabs in India evolved during the reign of Nawab Asaf ud Daula, a ruler known for his generosity, architectural masterpieces like pillar less Bara Imambara and Roomi Darwaza and for his love for food and innovation. By the time Nawab came to power, the British rule was spread all over India, leaving the Nawab to concentrate on his life’s two big ambitions; building architectural master pieces and evolving and refining the Awadhi cuisine. Food historian often refer to the period of his reign as the ‘renaissance of cuisine’ for the inventions of dishes like parinda puri (a love bird inside a poori), patili kebab, moti pulao and arbi ka saalan. It is said that the Nawab was so fond of kebabs that he had specialised rakabdars (royal cooks) who worked tirelessly to create a new kebab every day. Even the vegetarian kebabs made of arbi, jackfruit and bottle gourd had to taste different. This obsession grew manifold during the building of the Bara Imambara and it is said that every night the Nawab would ask a few of his servants to break whatever was constructed. There were two reasons behind this childish behaviour; first, to keep the workers busy during the great famine of 1793 so that they could earn a living and second, to keep cooks busy creating newer versions of kebabs that were soft, succulent and would keep him puzzled to find that one special ingredient used. Innovation became the key and the rakabdar devised newer ways of slow cooking, smoke flavouring and using exotic ingredients like sandalwood, juniper berries, rosebuds, red ginseng and pathar ke phool. Some even suggest that the Galwati Kebab, also known as Galwti Kebab, was debuted during the 14 years of building the Bada Imambara. As the story goes, the Nawab, who was an infamous couch potato, had lost the use of his dentures and was looking for something pate style, which needed now chewing yet imparted the flavours of fine kebab and his rakabdar Haji Mohammad Fakr-e-Alam Saheb, the creator of the Moti Pilaf, presented him with Galaouti Kebab with 160 secret spices which became the draft to work on for chefs thereafter. Meat suddenly became the play dough for chefs as each generation went on perfecting the shahi mixture, giving it a creamier, silkier texture. The enterprising son of Haji Mrad Ali established the kebab shop at the old Chowk of Lucknow in 1905 under the patronage of Wajid Ali Shah that became popular as Tunde Kebabi, a brand under which his generations have sold some of the best tasting kebabs including the one galawati inspired: the Kakori Kebab which has another interesting tale. As per the legend goes, in late 1800s, a local aristocrat Nawab Syed Mohammad Haider Kazmi, ruler of Kakori, threw a party during mango season for his British friends and one of them made a snide remark about the coarse texture of the Seekh Kebabs and said they were little coarse for a sophisticated taste. Humiliated by this insult, the Nawab summoned his rakabdars (cooks) and hakims (doctors) the very next day and asked them to come up with a more refined variety of the Seekh Kebab. After ten days of extensive research and experimentation resulted in the now famous Kakori Kebabs, the softest and finest version of Seekh Kebabs which met with great applause. The secret ingredient was the use of Malibali mangoes that were used to tenderise the meat, and since then the art of using fruits like raw mango and papaya to tenderise meat became an inspiration for world cuisine.. The variety of kebabs are seemingly endless. Apart from Galawti Kabab, Kakori Kabab and Tunde ke Kabab, there are many other meat based kababs like Tikka Kebab, Shami Kebab, Soovar ki Saanth (Pork belly kebabs from Rajasthan) and Rajpooti Soolah, which are native to India. The kebab in the Indian context is not just about meats, owing to widespread prevalence of vegetarianism in India, there are many local, vegetarian varieties of kebabs made from paneer (Indian cottage cheese) and potato etc. In fact some delectable Indian variations like Hariali Kebab, Paneer Tikka and Dahi Ke Kebab owe their origin to India. Though the kebabs are made across the world, in myriad ways using various ingredients and spices, they are at best interpretation of what the real deal would have been, largely because of the unwillingness of the royal chefs to part with the recipes. 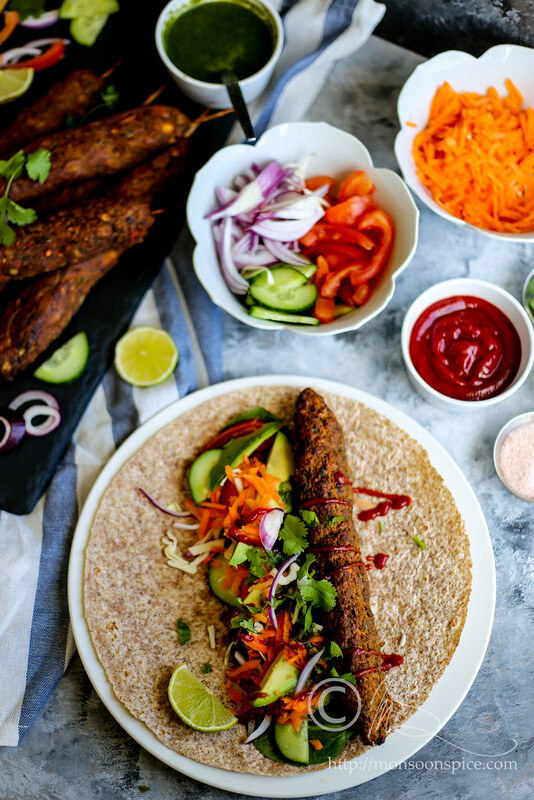 So whether you’re enjoying kebabs in the comforts of your backyard or on the streets of a bustling city, there is no denying that this is a favourite shared by all. 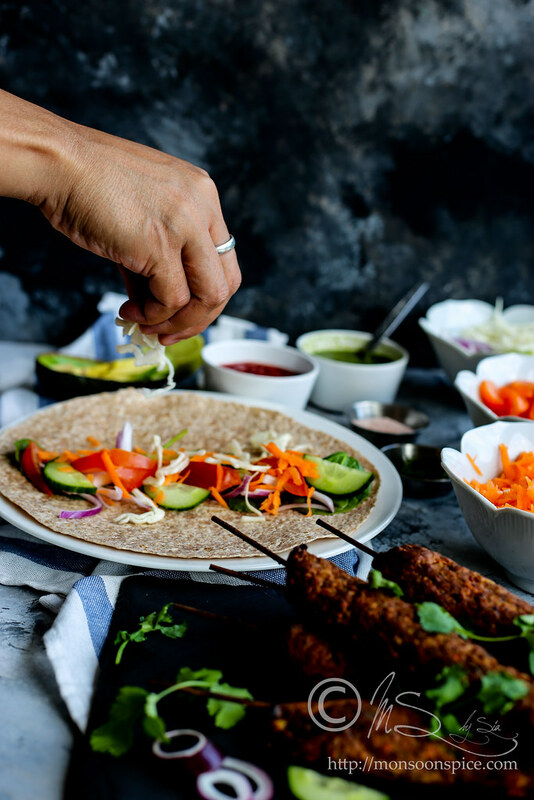 Although kebabs have their roots in the Mediterranean and Middle East, they have been able to make their way around the world to be enjoyed by everyone! 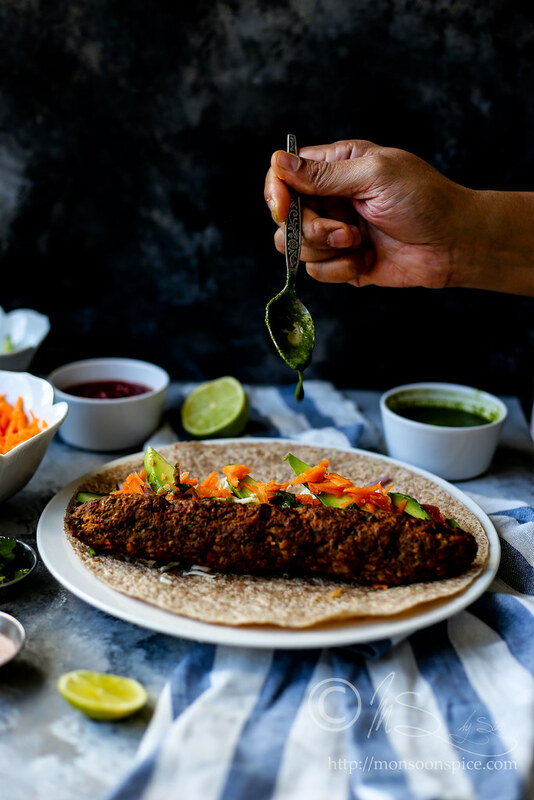 Inspired by such amazing history and the passionate cooks of the bygone era, I made these Baked Vegetarian Seekh Kebabs which melt-in-the mouth texture. 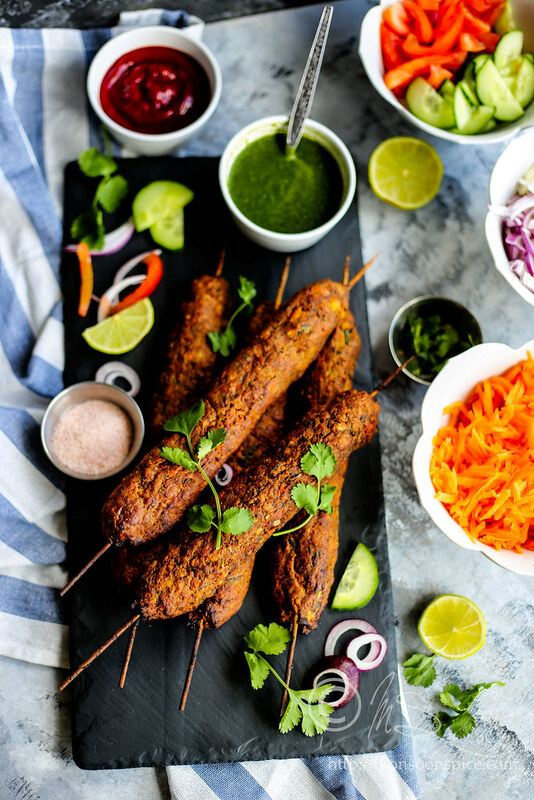 Studded with dry nuts and flavoured with most aromatic spice mixture, these Veg Seekh Kebabs have finely chopped or grated vegetables and paneer. Right off the bat, let me tell you that my personal experience with Seekh Kebab is limited to what I have tasted in a few restaurants, both in India and abroad, and to what my friends have described to me. So I am not claiming this is be authentic recipe, but it is the result of relentless quest to make that perfect textured, flavoured kabab! It took me little over 10 years and numerous attempts to get here, and I think it’s only fair to ask you to give credit to the source if you try this recipe and/or share it on social media or blog it. Coming back to the recipe, there are few things you need to note down when making these Veg Seekh Kabab. I have baked these kebabs in an oven, but you can grill them in a BBQ on a bed of coal or fire or using the grill function on the oven/microwave or using the grill pan on a stove top to get equally good result. One, the spices used in this recipe are just a small part of what believed to be more than 50 spices used in the original recipe. Two main ingredients in this mix are long pepper (pipli in Hindi) and amchur (dry mango powder). While the first one gives warmth, the latter tenderises and gives acidity to the kabab. You can skip using long peppers and replace amchur with lime or lemon juice in case you can’t find these ingredients. Second, use grater as much as possible if you are not good with knife skills. Ideally the kebab mixture should resemble a paste like texture, but I like to have little bit of coarse texture and hence finely chop or grate the ingredients which gives it that little coarse texture. Third point to keep in mind is to make sure that the veggies are almost moisture free and thus stir frying on high heat helps to remove excess moisture. Fourth point to remember is that you refrigerate the mixture before grilling. Why I am stressing on this point is due to the fact that sticky, moist, homogenous kebab mixture is difficult to shape into long sausages and it will dry up and fall apart while grilling. I have learnt this a hard way! Finally, make sure you roast the gram flour until they taste nutty. 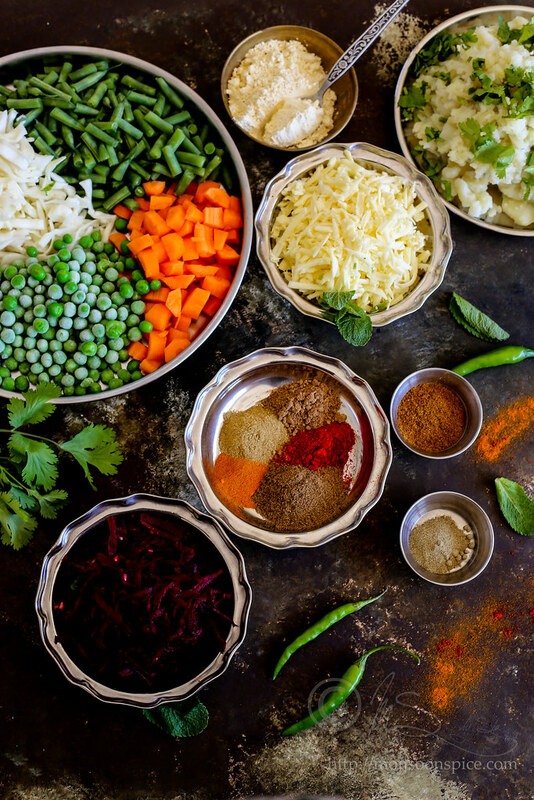 Trust me, the raw taste of gram flour is not pleasing at all…Keep these points in mind and you will end up with one of the best tasting kababs ever! If you are gluten intolerant, skip the bread crumbs and increase the gram flour to 1 cup to make it gluten-free. To make it vegan, use soya mince or crumbled tofu in place of paneer but note that the texture will be little chewy as compared to melt-in-mouth texture of soft paneer. If using soya mince, take about ¾ cup of soya mince granules in a bowl and cover it with hot boiling water for 10-15 minutes. Drain all the water through colander or sieve and squeeze the mince in fist to remove excess water and use it in the recipe in place of paneer. If using bamboo skewers, immerse them completely in a bowl of water for 2-3 hours. This will prevent them from catching fire when grilling in BBQ or baking in an oven. Boil the potatoes covered in a pan or in a pressure cooker. Let it cool down a little before peeling and grating it. While the potatoes are cooking, prepare the vegetables and paneer for the kebabs. Grate or crumble the paneer and keep it aside. Peel and finely chop the onions. Finely chop the green chillies and keep them aside. If making a fresh ginger-garlic paste, peel and finely chop ginger and garlic and crush them to fine paste in a pestle and mortar or in a spice grinder along with generous pinch of salt. Keep it aside until needed. Peel and dice the carrots into 1 cm cubes. Trim the French beans and remove the strings before cutting them to ½ inch long pieces. Wash the cabbage and finely shred or grate them. Thaw the green peas if using frozen green peas. Peel and grate the beetroot and keep them separately in a bowl until needed. Chop the cashew nuts and almonds into small pieces and keep it aside. Wash and finely chop fresh coriander and mint leaves and keep them aside. Roast the gram flour on low heat for 4-5 minutes or until it changes colour to light golden brown and the raw smell disappears. The gram flour will get a beautiful nutty aroma when roasted. Transfer it into a bowl and let it cool down to room temperature. Heat a tbsp. of oil in a pan on medium flame and when hot, add cumin seeds. Add hing/asafoetida (optional) when cumin seeds crackle and turns golden brown, about 1 min, and fry for couple of seconds. Next add finely chopped onions and green chillies and sauté until the edges turn golden brown, about 1-2 mins. Add the ginger-garlic paste and fry until their raw smell disappears, about 2 mins, on medium flame. Next add the diced carrots, chopped French beans, peas and shredded cabbage. Add salt to taste and mix them all well. Cover the pan and let the vegetables sweat for 3-4 minutes. Remove the lid and mix in turmeric powder, cumin powder, coriander powder, black salt, chaat masala, kitchen king masala, long pepper powder, black pepper powder, dry mango powder and garam masala. Mix them all well and increase the heat to high and stir fry the vegetables for 4-5 minutes or until all the moisture is evaporated. Mix in the grated beetroots and turn off the flame. Transfer the vegetables into a plate and let it cool down to room temperature. Once the mixture has cooled down to room temperature, transfer it into a blender or food processor and pulse them to get a coarse paste. The mixture should be coarse with bits and pieces of vegetables and not a smooth paste. Transfer this mixture into a mixing bowl and to this add the grated paneer, grated boiled potatoes, half of roasted gram flour, bread crumbs and corn flour. Add finely chopped fresh coriander and mint leaves and finely chopped cashew nuts and almonds. Mix them all well and knead them into soft dough like mixture. The mixture should be moist and should hold shape when pressed together in a fist. If the mixture is too moist and doesn’t hold the shape, add the corn flour or roasted gram flour, a tbsp. at a time. Pinch a small fist full of mix and press it to see if the mixture holds shape. If not, add little more corn flour or roasted gram flour and mix them well until you get a desired consistency. Cover the bowl and refrigerate the mixture for at least an hour. This will firm up the mixture and will be easier to shape them into kebabs. If cooking in an oven, preheat the oven at 200 deg C. Line the baking tray with parchment. Lightly grease the palm with little oil which will help to shape the mixture without sticking to your hand. Pinch a tennis ball sized mixture and then evenly sculpt mixture around bamboo or metal skewers to form long sausage shape of about 1 – 1¼ inch thickness. Arrange the kebabs on a baking tray, making sure they are not crowded and are spaced at least 2-3 inches apart. Brush the kebabs with some oil or ghee or melted butter on all sides and bake them for 20-25 minutes, rotating periodically and brushing the kebabs with some oil so that all the sides are cooked and turn golden brown. 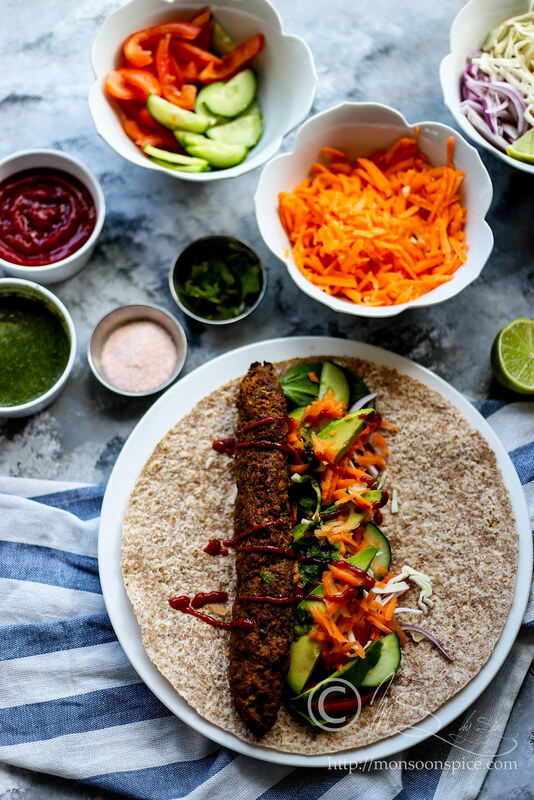 There are chances of kebabs sticking to the parchment sheet as they release moisture when baking, so very gently use a spatula or knife to scrape the stuck part. The kebabs are quite soft and there are chances of them falling apart, so be careful when handling them while cooking. If using grilling pan on a stove top, heat the griddle and drizzle some oil. Brush the kebabs with some oil before cooking them in batches of 2-3 at time. Make sure that you cook them on medium to low flame so that the kebabs are cooked through and don’t end up burning. It will take around 12-15 minutes per batch to cook the kebabs on low flame. 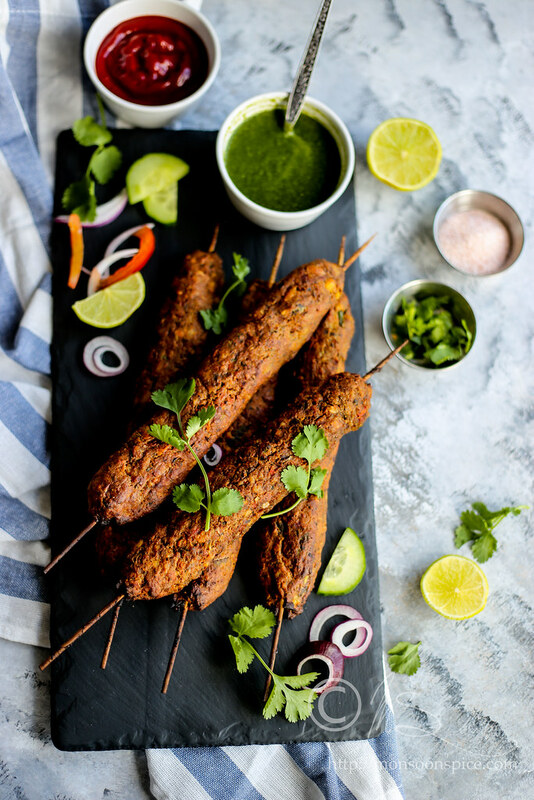 Serve these delicious melt-in-the-mouth Veg Seekh Kebabs on its own with a side of spicy green mint chutney or just good old ketchup. 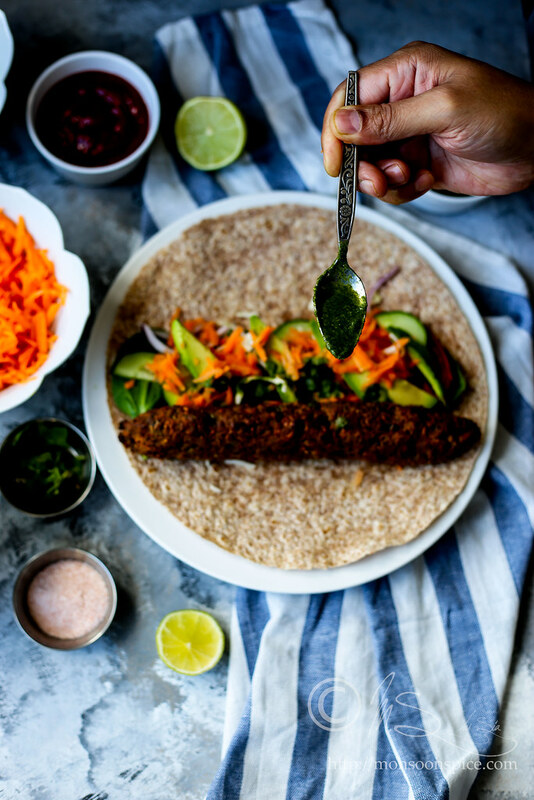 You can serve the kebeb as a filling for wraps or pitta bread, along with some thinly sliced onions, tomato, cucumber, avocado, shredded cabbage and carrots or any veggies of your choice, drizzled with some spicy green mint chutney or chilli sauce for added spice kick. 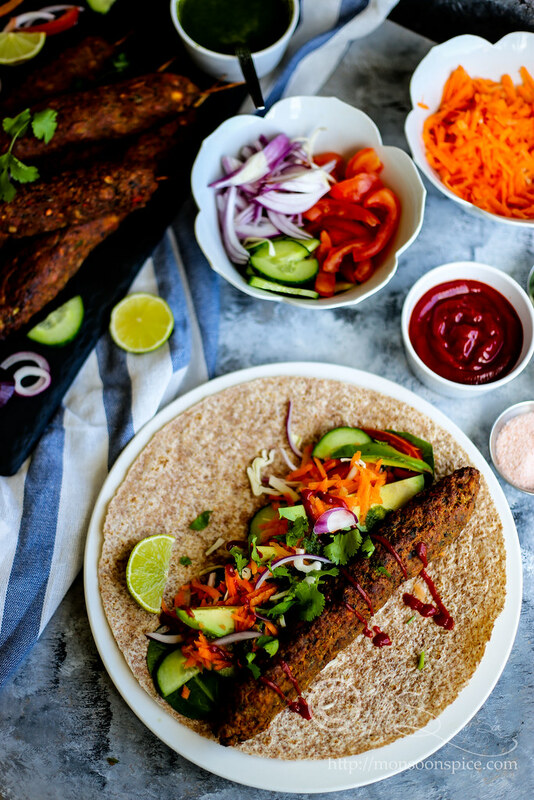 There are few things you need to note down when making these Veg Seekh Kabab. 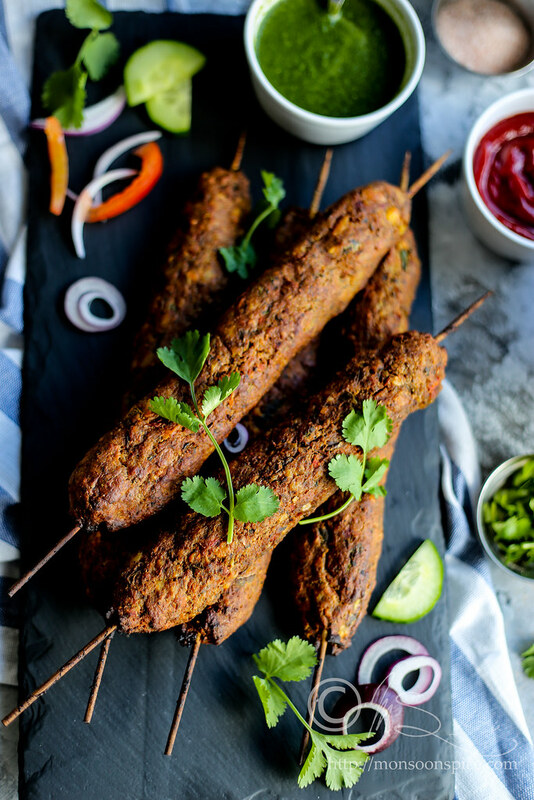 I have baked these kebabs in an oven, but you can grill them in a BBQ on a bed of coal or fire or using the grill function on the oven/microwave or using the grill pan on a stove top to get equally good result. The spices used in this recipe are just a small part of what believed to be around 160 spices used in the original recipe. Two main ingredients in this mix are long pepper (pipli in Hindi) and amchur (dry mango powder). While the first one gives warmth, the latter tenderises and gives acidity to the kabab. You can skip using long peppers and replace amchur with lime or lemon juice in case you can’t find these ingredients. Next, use grater as much as possible if you are not good with knife skills. Ideally the kebab mixture should resemble a paste like texture, but I like to have little bit of coarse texture and hence finely chop or grate the ingredients which gives it that little coarse texture. Another thing to keep in mind is to make sure that the veggies are almost moisture free and thus stir frying on high heat helps to remove excess moisture. Make sure you refrigerate the mixture before grilling. Why I am stressing on this point is due to the fact that sticky, moist, homogenous kebab mixture is difficult to shape into long sausages and it will dry up and fall apart while grilling. I have learnt this a hard way and if you keep this in mind, you don’t have to repeat the same mistake I did! 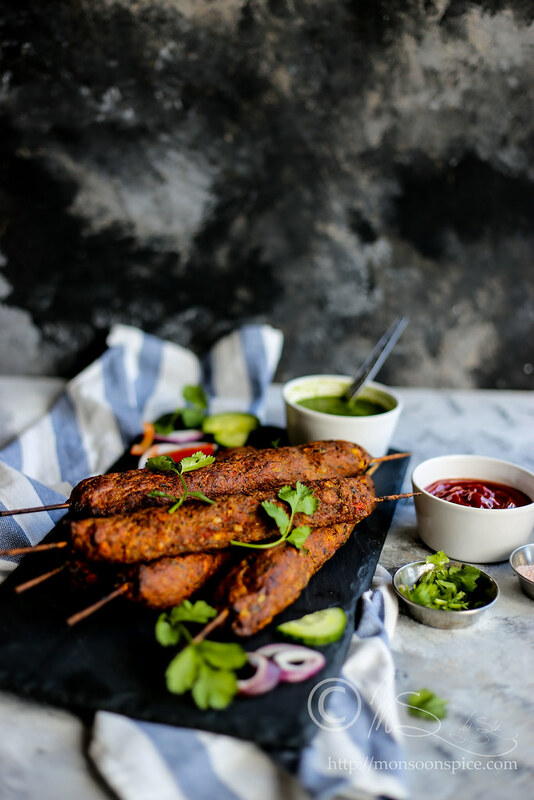 You can serve these delicious melt-in-the-mouth Veg Seekh Kebabs on its own with a side of spicy green mint chutney or just good old ketchup. 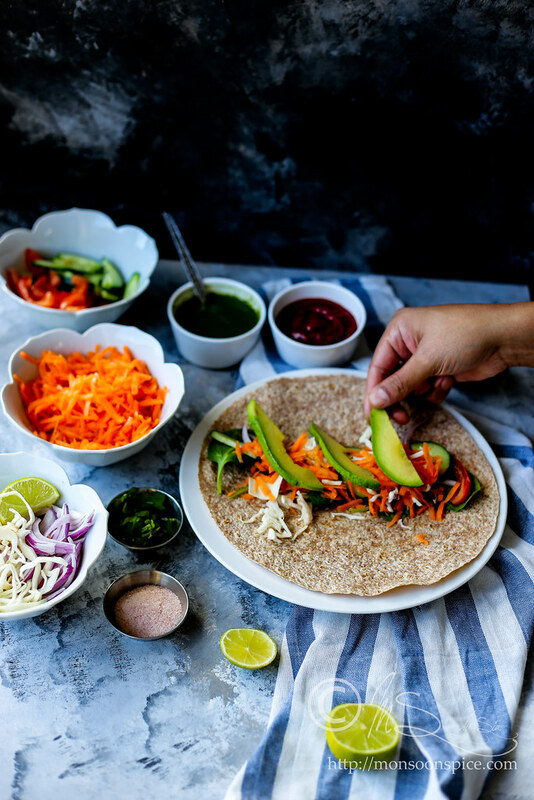 Also, you can serve the kebab as a filling for wraps or pitta bread, along with some thinly sliced onions, tomato, cucumber, avocado, shredded cabbage and carrots or any veggies of your choice, drizzled with some spicy green mint chutney or chilli sauce for added spice kick. This looks pretty amazing!! I want to try these! The flavors are amazing. Seriously that green sauce looks amazing. 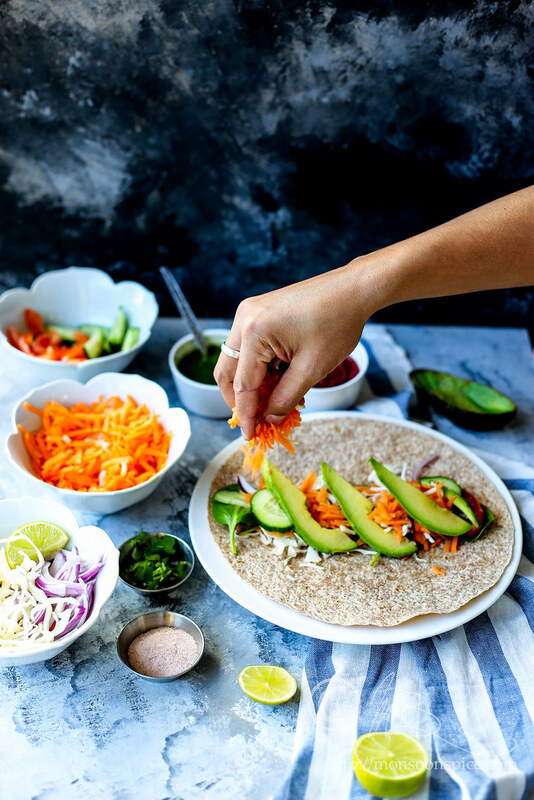 I love how healthy this recipe is, it looks amazing! Your pictures are just gorgeous. 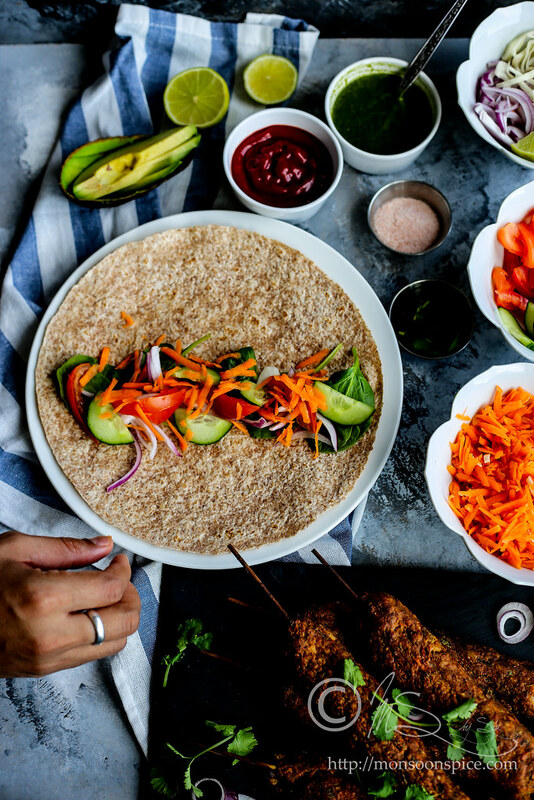 So many delicious flavours in this recipe, I can't wait to try it! I love the step-by-step photos to make this recipe super easy! Looks delicious!